Ray Bradbury passed away yesterday at the age of 91. The Martian Chronicles will always be one of my favourite books. I remember so vividly reading his short stories in elementary school. We read All Summer in a Day in grade 7 and were tasked with writing a continuation of the story – what happened after they let Margot out? The story was about a classroom of 9-year-old children living on Venus, where it rained constantly. The last time the sun had shone was 7 years earlier and the children had been too young to remember its warmth. Margot was ostracized and bullied – she had moved to Venus when she was 4-years-old from Earth, so she still remembered what the sun had looked and felt like. The scientists predicted that today, the sun was going to come out for only two hours. After another round of bullying from the children, they decided to lock Margot into the closet for fun. The sun indeed came out and in everyone’s joy and astonishment, they forgot to let Margot out so that she could partake in the festivities. He could’ve been describing life in Vancouver. It’s June 7 and it’s cold, wet, windy, and grey. Like so many of the days we’ve had since October. I walked the fifteen minutes to the SkyTrain station this morning, fighting against the pelting rain, my umbrella being whipped around by the winds. Everyone was wearing dark wintery clothing and boots, dripping from the elements. It amused me to see one woman, bravely (or stupidly) wearing strappy sandals as if to say, “It’s almost summer damnit, I’m going to dress like it!” Dress it and it will come. Summer. That word feels so foreign. I feel like those kids in the story – what does sunshine look like? Feel like? Smell like? I wore a scarf in my office. The knob on the heater is broken so I couldn’t even warm up my space. In honour of this cold, dreary, June-uary day (as my colleague called it today), dinner tonight is simple, cozy and comforting. 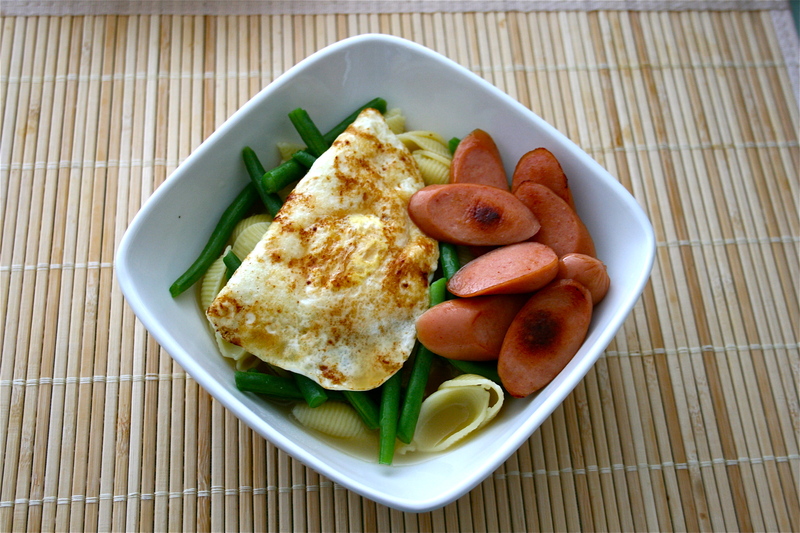 Shell pasta in homemade chicken broth, the Husband’s favourite Harvest wieners, a fried egg and young green beans. 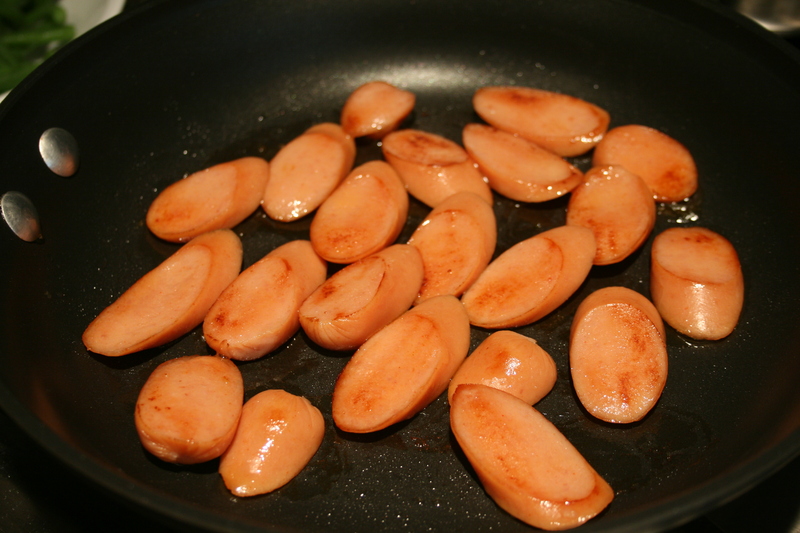 Look at ’em cooking in their own fat. Oh yeah! That’s a bowl of comfort right there. This is twist on a Hong Kong-style cafe breakfast staple, a meal that’s good any time of day! For those of you who are interested in how I finished Mr. Bradbury’s sublime short story as a 12-year-old girl, I have always had a morbid streak running through me. Margot emerged from the closet and bided her time while plotting her revenge. She did away with all her classmates (I won’t go into detail) and stood in the rain, blood washing away as she lifted her face to the grey unyielding sky. Definitely not something Mr. Bradbury would have written! Let’s sweeten this post a bit. 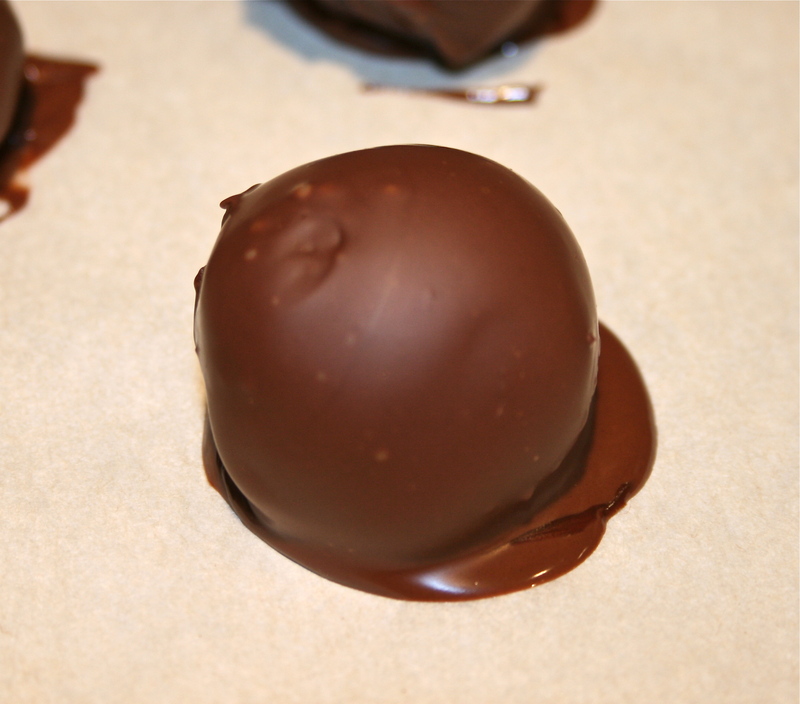 Here are pictures of my attempts at making truffles last night. I could drink this entire bowl right now! Let’s leave you with an image of the best looking one. I consider this attempt an abysmal failure (I’m one of those annoying type-A perfectionists) but I got a nice shot of the few pretty looking morsels I produced. 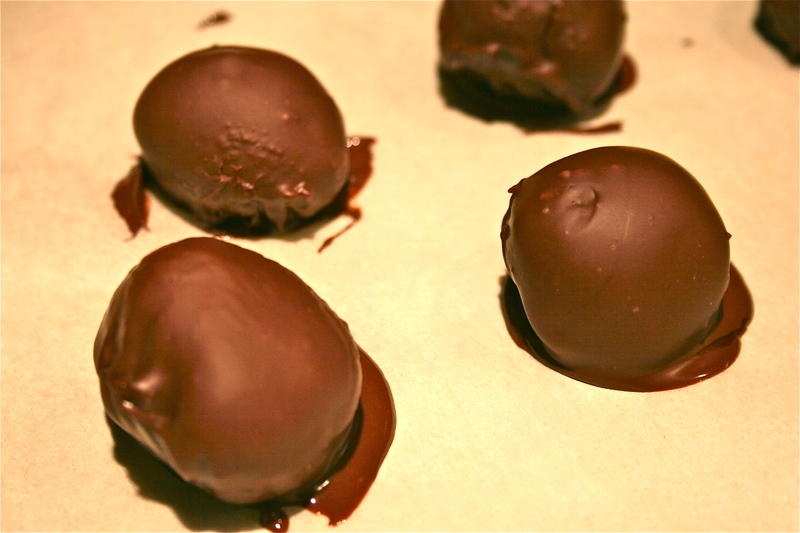 The ganache I used was way too soft, even after throwing them into the freezer for a few minutes. 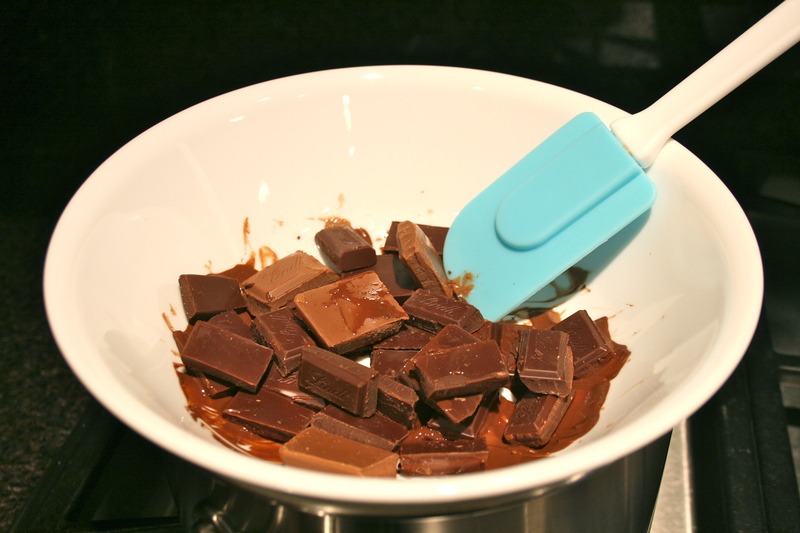 They kept melting into the chocolate, which kept getting grainier and grainier until it wasn’t even sticking to the balls of ganache. 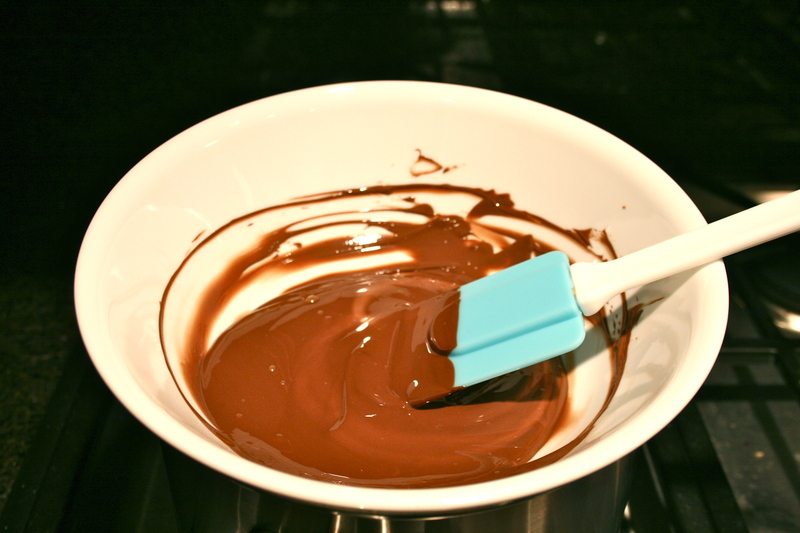 Oh well – this just means I’ll have to eat the ganache as is, which really isn’t a bad situation to find myself in! ooo i want to make a vegetarian version of that hong kong style breakfast. you make it look so good! too bad the truffles weren’t cooperating but i’m sure the resulting chocolate still tasted delicious! I remember that story quite vividly, although I read it on my own in my late teens, I think. It haunts me periodically. I would have volunteered to dispose of the (in your eyes) unlovely truffles!!! !